Happy Sunday ladies! Notice anything different? We took some pictures indoors for once! As I've mentioned before, the weather seems to be getting worse so I had no choice but to take some pictures inside. It's nice to actually not be freezing! Sadly, the lighting is totally messed up but it's the outfit that counts right? I'm a huge fan of cropped sweaters with high-waisted skirts and consider it to be a go-to outfit no matter what the season is. 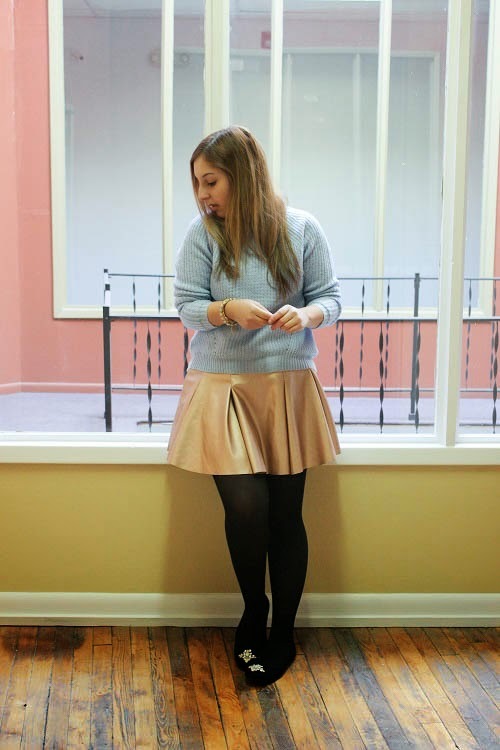 This metallic skirt is defiantly my favorite since it's in the color rose gold! That color is so hard to find in anything other than jewelry so I had to splurge and get it. 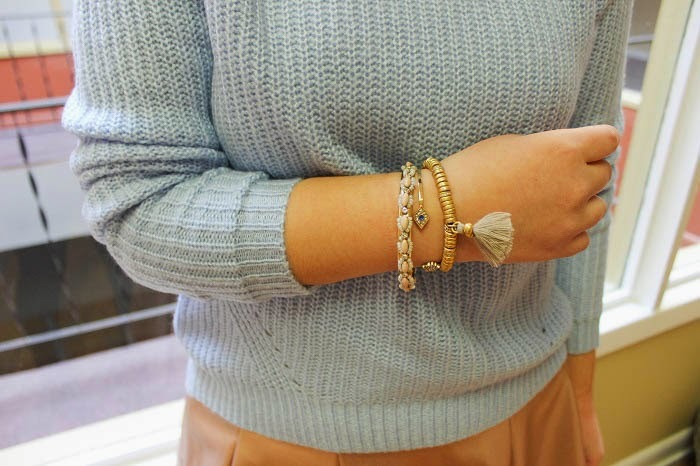 I never thought about wearing it with baby blue before but oddly enough it's a great color combo together. I'm also wearing some new flats which I was going to save until the weather gets better but it went with the outfit so nicely that I had to wear them now. 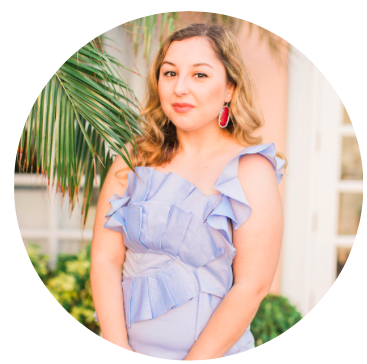 What's your go-to outfit lately? Let me know in the comments below! Gosh those flats are so delicate and gorgeous! You look adorable! 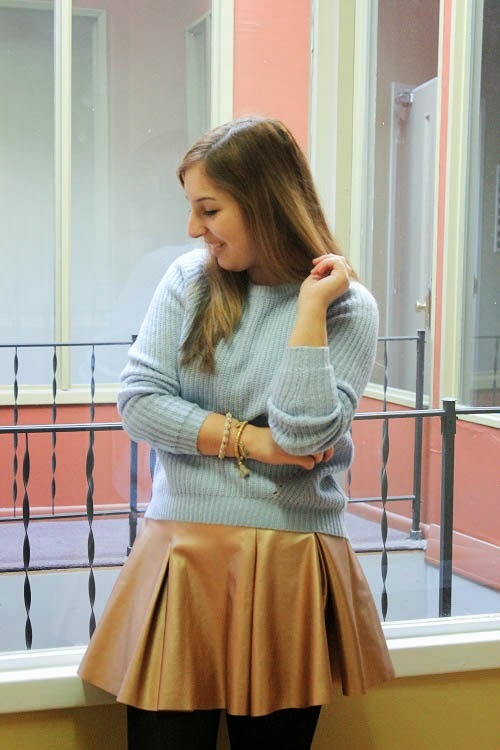 I'm loving that sweater and it's so perfect with the gold skirt! So pretty! so cute! love the little skirt! Beautiful look! I love that skirt! I've never taken indoor photos, but yours look so good I'm not afraid to anymore! Thank you Jessica, you should defiantly try it! Thank you Cynthia, glad you liked it! Gorgeous look, Ruya! I LOVE rose gold! I think your indoor pictures are great! I was just thinking of setting up indoors for some pictures today because of this terrible cold, gray, and snow. I love the mix of neutral colors. It looks luxe. Defiantly try it! So much better than taking pics outside in the winter. Thank you Tracy! Very cute flats and I like how they look with the stocking. 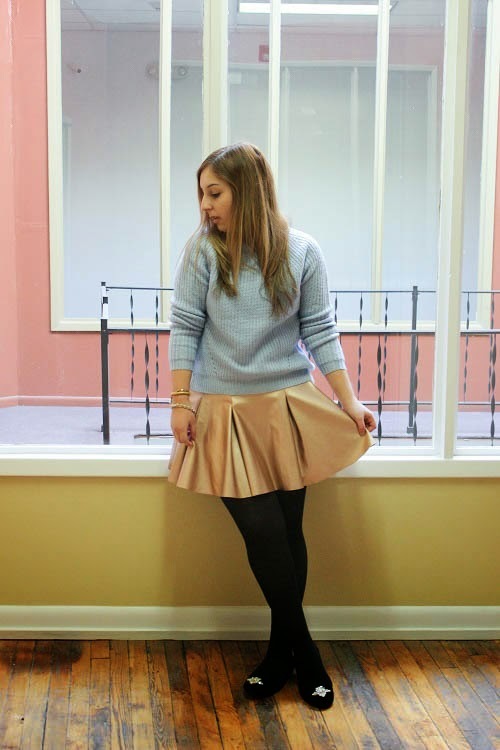 Gorgeous look Ruya - I love the gold skater skirt but I also love that cozy baby blue sweater which I also own a similar one!! love the shoes! so adorable!